Boeing-Sikorsky's offering for the US Army's Joint Multirole Technology Demonstrator (JMR-TD) programme is expected to complete its critical design review in the coming months, company executives told IHS Jane's on 9 September. 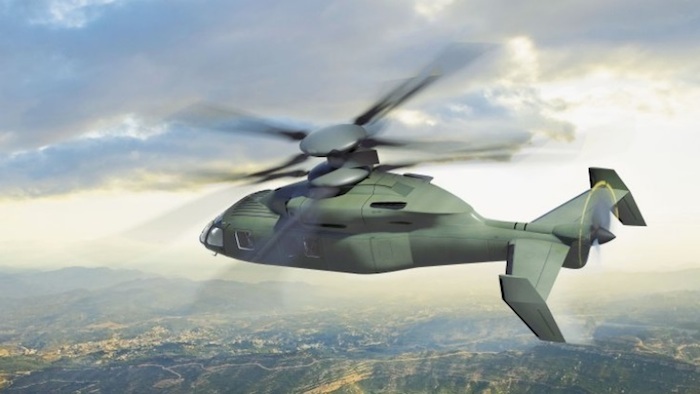 "We're in detailed design and looking forward to a critical design review in the latter part of this year," said Doug Shidler, Sikorsky's Defiant programme director. 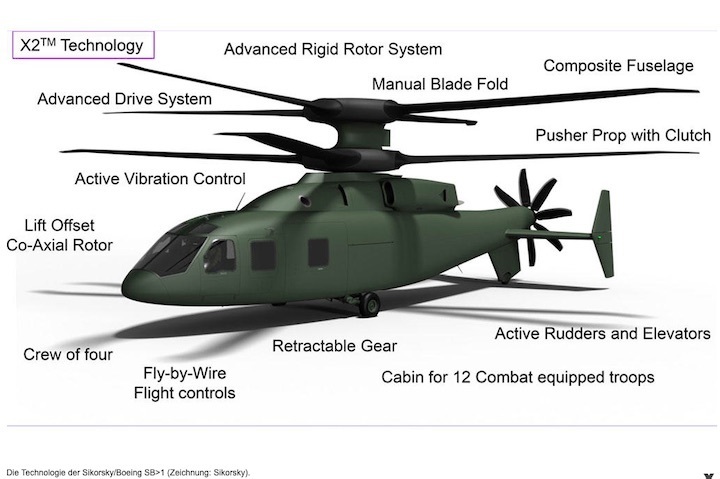 Boeing is teamed with Sikorsky on the army's JMR and follow-on Future Vertical Lift (FVL) programmes. 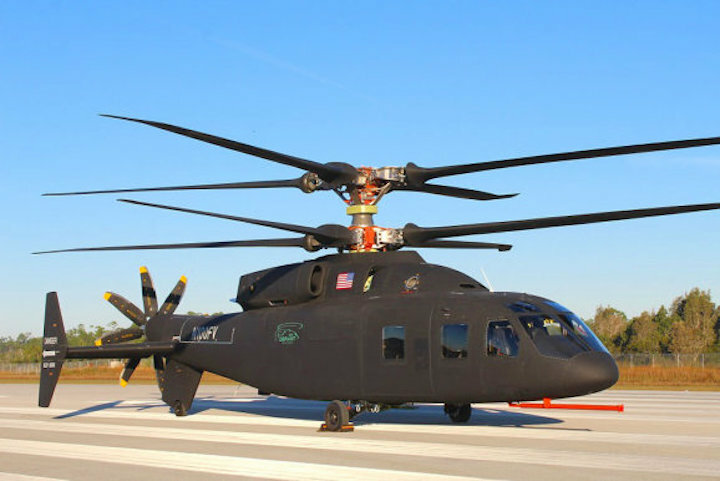 The companies' offering for JMR, the SB-1 Defiant compound co-axial helicopter, is based on the Sikorsky S-97. The team is one of two building demonstrators, the other being a Lockheed Martin-Bell team offering Bell's V-280 Valor tiltrotor aircraft. In this 'detailed design' phase, "parts are being sized … so that manufacturers can produce those parts," said Shidler. "We have been in detailed design since last year's preliminary design review, and we are wrapping up this year." Pat Donnelly, Boeing's programme director for the team's JMR offering, said the team's supply chain is already producing parts for the demonstrator. "In parallel with detailed design, we're also producing parts in preparation for our final assembly in the middle to third quarter of next year," he said. "That is all in preparation for getting into ground test and then flight test in 2017." Shidler said the companies are also building and testing a propulsion system test bed into 2016, while their systems integration lab will be fully operational in the first quarter of the year. Further, the companies chose the Lycoming/Honeywell T55 engine that powers the Boeing CH-47 Chinook for the demonstrator. Shidler said the companies plan to fly Defiant at speeds up to 250 kt, slightly in excess of the 230 kt required by the army's 2012 Broad Area Announcement. "We have designed fuel tanks to support the requirement, presuming that a modern technology engine will be available at a later time," he explained. Flying the 30,000 lb Defiant will also be a demonstration of scalability. The S-97 it is based on was a 7,000 lb vehicle, while the S-97's precursor, the X2, weighed 2,000 lbs. "So we are demonstrating that this technology does, in fact, scale and does continue to exhibit the excellent handling qualities of a rotorcraft while going speeds of 230-plus kt," said Bailey. Sikorsky und Boeing haben die ersten Fotos des neuen Hochgeschwindigkeitshubschraubers SB>1 Defiant veröffentlicht, der in West Palm Beach auf den Erstflug vorbereitet wird. Kurz vor Weihnachten 2018 präsentierte sich der Sikorsky/Boeing SB>1 Defiant im Testzentrum West Palm Beach, Florida (Foto: Sikorsky). Mit dem SB>1 nehmen Boeing und Sikorsky am Joint Multi-Role Technology Demonstrator Programm der U.S. Army teil. Konkurrent dabei ist die Bell V-280 Valor, die bereits seit Dezember 2017 in der Flugerprobung ist. Bei der SB>1 handelt es sich um einen zweimotorigen Flugschrauber, der über einen sehr steifen Koaxialrotor und einen zusätzlichen Propeller für den Vortrieb verfügt. Er soll damit die doppelte Geschwindigkeit von konventionellen Hubschraubern (über 450 km/h) erreichen und auch eine hohe Reichweite bieten, ohne die Agilität zu beeinträchtigen. Die SB>1 sollte bereits 2017 fliegen, doch gab es wohl erhebliche Probleme mit der automatischen Fertigung der Rotorblätter. Zuletzt wurde ein Erstflug Ende 2018 angepeilt.